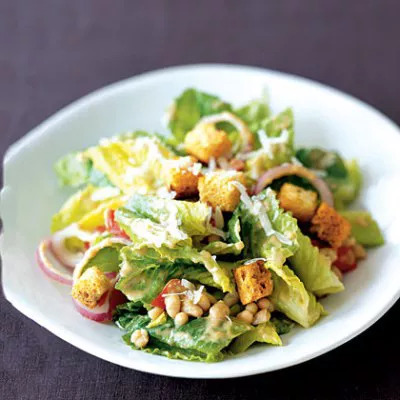 Caesar salad is popular, but it's one salad that can over-deliver calories due to the egg yolks (in the dressing), anchovies, vegetable oil, and high-fat croutons. Our recipe is a vegetarian version that cuts the yolks and anchovies. Caesar salad is popular, but it's one salad that can over-deliver calories due to the egg yolks (in the dressing), anchovies, vegetable oil, and high-fat croutons. Our recipe is a vegetarian version that cuts the yolks and anchovies, and uses white beans for fiber and protein, low-fat croutons, and heart-healthy olive oil. It's topped with diced tomato and red onion—adding a pop of flavor—and lightly sprinkled with Parmesan cheese. The recipe delivers 181 calories, 5 grams of fiber, and 8 grams of protein per each 1.5-cup serving. Lower the calorie content even more by making your own croutons: Dice 2 slices of whole-grain bread and season with garlic powder, salt, and pepper, and then toast in the oven until brown and crunchy. Add a grilled chicken breast (or even rotisserie chicken) to this salad for added protein.